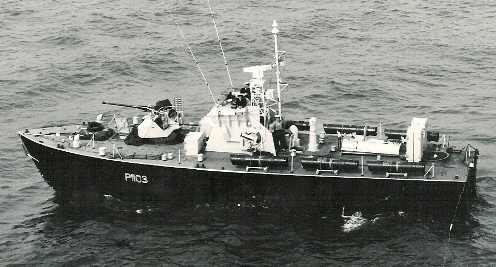 The "Dark" class, or Admiralty "Type A", were designed as interchangeable MTB/MGB's and were the first Royal Navy fast attack craft to be fitted with diesel engines. These were of course much less vulnerable that previous petrol engined craft and had a much-extended radius of action. 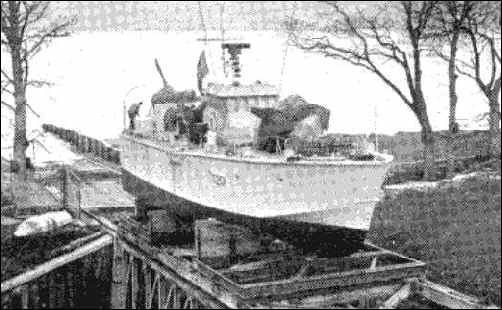 The boats were of composite construction, alloy framing with wooden decks and skin and could easily be changed into Torpedo Boat, Gun Boat or Minelayer configurations. Dimensions were LOA 71ft 8ins, Beam 19ft 5ins, and with a 'dry' Draught of 6ft 1ins. Normal complement were 15. Main Armament could be 4 x 21in Torpedo Tubes, or 2 x 21in with a forward mounted 40mm Bofors gun. A single 4.5ins Gun mounted on the forward mounting with a 40mm Bofors mounted aft or carry up to 16 Mines. Displacement was 50 tons standard, 64 tons full load. Main machinery was 2 Napier Deltic 18 cylinder marine diesel engines delivering 5000shp = 47 knots. In later builds the Foden generator could be used to power a pre-engaged electro/hydraulic motor on the Starboard shaft for 4knot silent running. 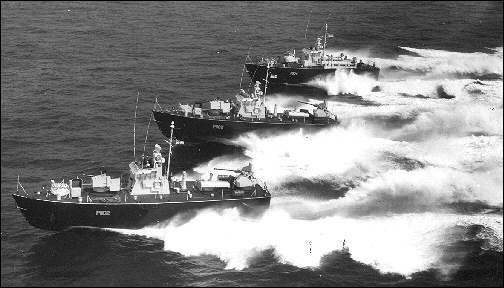 A total of 27 units were originally ordered by the Admiralty, spread over 7 builders including the design contractor Messrs Saunders Roe of Beaumaris, Anglesea Nth Wales, however due to a change in MOD thinking concerning Coastal Forces within NATO, nine were cancelled in 1955. One 'Dark Horseman', actually part built and on the stocks at Messrs McGruer (Clynder) but they completed Dark Hero P1115 launched March 16th 1957. Saunders Roe, the designers, built 6 for the Royal Navy. Dark- Adventurer (P1101). Aggressor (P1102). Antagonist (P1103). Avenger (P1105) Biter (P1104) with an all aluminium version (skin, frames and decks)- Dark Scout (P1120). They had 3 cancelled- Attacker, Battler, Bowman. (No Pennant numbers for cancelled craft). Messrs Saunders Roe also exported the all Aluminium version to- Burma (5 units- T201-T205), Finland (2 units, Vasma1 and Vasma2) Japan (1unit name, or number as yet unknown). This craft arrived at Yokosuka Naval Base on 29th July 1957, accepted into the Japanese Naval Defence Force on the 2nd September 1957 and given the Pennant Number of PT9, finally being ‘struck off’ in 1972. Messrs Vosper (Portchester) were contracted to build 7- Dark Buccaneer (P1108), Clipper (P1109), Highwayman (P1110), Rover (P1107) but had 3 cancelled- Chaser, Chieftain and Crusader. Messrs Taylor (Chertsey) contracted to build 2- Dark Fighter (P1113) Gladiator (P1114) Messrs Millar (St Monace) built 1- Dark Hunter (P1116) this vessel was the first actually launched (March 16th 1954) and not the class leader (P1101). Although 'laid down' first, that boat was launched in October 1954. Messrs Thornycroft (Hampton) built 1- Dark Hussar (P1112) having 2 cancelled-Defender and Explorer. 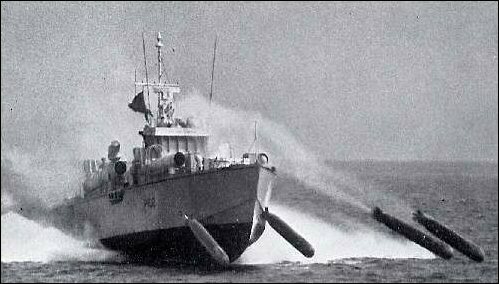 The last RN "Type A" to be launched was Dark Scout (P1120) on March 28th 1958, one year after Coastal Forces, as a separate entity within the RN, officially ended.